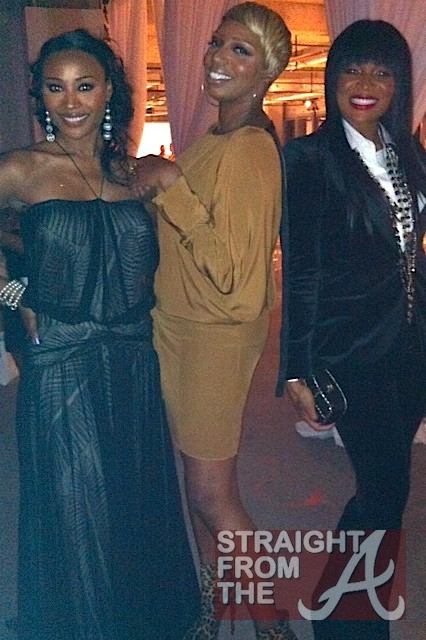 A few of The Real “Housewives” of Atlanta were spotted at Jeffrey Fashion Cares, a charity fashion show in Atlanta held over the weekend (August 29, 2011). Cynthia Bailey, NeNe Leakes & Marlow Hampton have all returned from their South African excursion and appear to be adjusting back to the same ol’ same ole. Marlo, the newbie of the crew, was rocking “all Gucci everything” from head to toe and looked quite stunning (albiet hot as hell for late August) in a velvet suit from Gucci’s Fall collection. The event, created by fashion designer Jeffrey Kalinsky, was held to benefit the Susan G. Komen for the Cure and the Atlanta AIDS Fund.